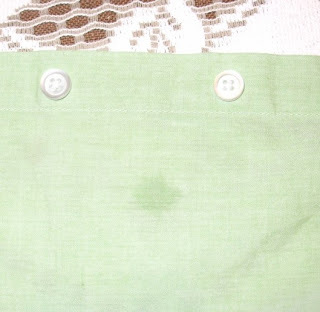 I got a grease spot on my brand-new birthday present blouse from my grandmother. It didn't come out when I ran it through the washing machine. Fortunately I knew what to do. Back at Thanksgiving time, the turkey I bought turned out to be the fattiest, greasiest turkey I had ever seen. There was a layer of blubber under the skin, and the drippings were more oil than juice. After dinner, my tablecloth was a disaster of grease stains. I put it through the wash twice with no improvement. Then I got out my Yankee Home Hints book. It said to use distilled water to wash out stubborn grease stains. So I poured a gallon of distilled water in a bucket, added dish soap, and dropped in the table cloth. I squished the table cloth around a little, then dumped the bucket in the washing machine and ran a cycle. The table cloth came out perfectly clean! Fast forward to the present. 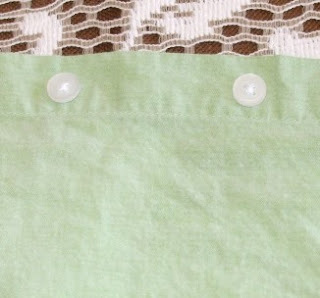 I used the same trick on my blouse, and now it is just like new. I found that it is better to mix the dish soap with the distilled water and then add the item to be washed rather than putting the dish soap on the grease stain and then putting the item in the distilled water. I don't get it... why would distilled water make a difference? Cool that it does, though. Thanks for the hint, Heloise! In ordinary tap water there are impurities--minerals that hinder the action of the soap. It is the difference between hard water and soft water. Distilled water is as soft as it gets, so the soap can do its job on the grease. She does the cha cha, makes harps, writes books, and knows her chemistry, ladies and gentlemen. Impressive. I'm glad you have your new shirt back. Ah, so. That's why I quite my chem major and switched to history. I can tell you how to make soap from ashes and pig fat, but I can't tell you why the soap works. Thank goodness for Rebecca! Remarkable. How do you get urine smell out of the car when your sweet child decides to relieve themself unexpectedly. And don't think this was a boy! If you don't know, nobody will. Urine smell? Try lemon juice. Let me know how it goes.